The start of a new year is always a great time to take a look at your marketing for your wedding business and decide where to invest. If showing up higher on Google searches is on your must-do marketing list for 2019, it’s time to develop your strategy. Search engine optimization can be a technical and overwhelming subject. If you’ve ever thought “I need to do some SEO” and then got lost in where to start, I get it. Below is a basic SEO plan that you can follow step-by-step to improve your rankings in 2019. Any good strategy should start with an understanding of where you are now. If you’re not sure what keywords your website ranks for as of today, I recommend signing up for a Moz account (it’s free) and using their Keyword Explorer tool. In the Keyword Explorer, change the search setting to “root domain.” Then, enter your domain name in the search box. 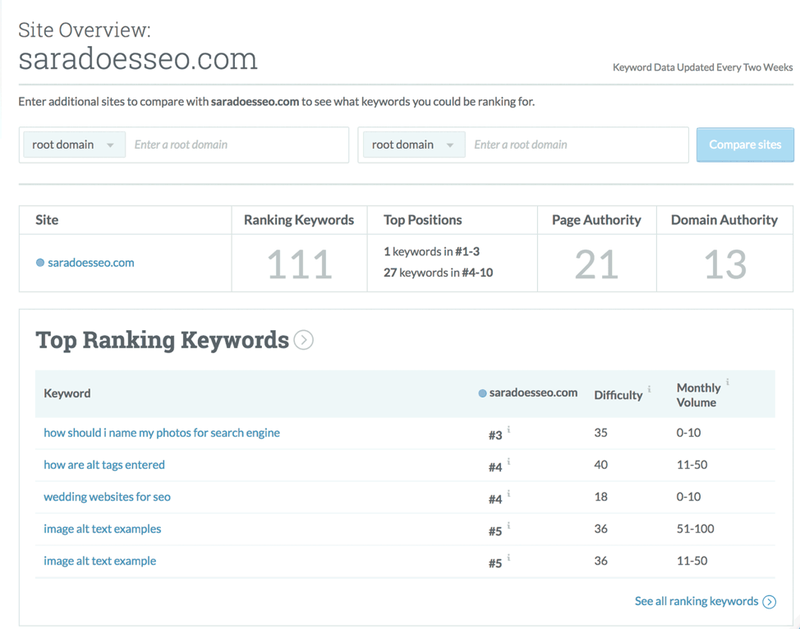 What you’ll see in the results is your Site Overview, including the number of keywords ranked. Make sure to click the link to “See all ranking keywords” to see the top 50 keywords your site is ranked for. Look through the keyword list to see which keywords you’d like to rank higher for and make note of them. You can also save the results by exporting them so you can compare to your rankings a few months from now. To start better optimizing your site and ranking in search results, you now need to brainstorm a list of keywords that are relevant to your website and business. These are the keywords you’d like to show up for when they’re searched on Google. ● Try searching on Google for a few of the keywords on your list. See what Google suggests as you type, and what it lists as “related searches” at the bottom of the search results. Once you have a big list of keywords, highlight or circle which ones are most important to you. This is the step I see missed most often in articles about SEO. They may tell you to “use your keywords,” but that might tempt you just to sprinkle the same keywords throughout your website. Instead, I highly recommend choosing one page on your website that you want to optimize really well for each keyword you chose. I know that making time to do the work for SEO is the hardest part. For your new year plan, commit a set weekly time to work on your content. This may mean editing old content to optimize it or writing new content to target keywords. Plan out the work you want to do and give yourself due dates. Here is the content calendar spreadsheet I use to stay organized in content creation. You might want to create one of these too! As you’re writing your content, I recommend following these best practices for on-page content optimization. Put your head down, stop searching for yourself, and work on your website content for a few months. Keep in mind that it takes Google time to recognize the changes you’re making to improve the content on your website. After about 3 months, check out a few metrics to see how you’re doing. Run your website through Moz Keyword Explorer again. Are you ranking for more keywords? Are you ranking higher? Review your Google Analytics. Are you getting more website visitors? Keep an eye on Organic Search traffic over time. Make note of any pages or posts that are performing well and see if you can create more content around similar topics. Not seeing the results you want? SEO is an ongoing process of website and content improvement, so don’t give up! Keep generating keyword ideas, adding to your content plan, creating helpful content your target clients would love to find, and monitoring your improvements and increased traffic. Sara Dunn is a wedding SEO consultant at SaraDoesSEO.com, helping wedding planners, photographers, venues, florists, and more reach rockstar status on Google.